A man shuffled across the narrow, uneven, cobble-stoned alleyways of Jerusalem. Outwardly he is old, but his soul has remained young through hope. Every now and then he is asked, "Simeon, Simeon listen a moment! You always seem to give the impression that you are waiting for something to happen?" "I am." Simeon answers, "I am waiting. I am waiting for Israel's coming consolation, I am waiting for the saviour." Simeon walks the streets of Jerusalem as a living reminder: "Do not forget God's promise! - Do not forget God's promise!" Now there was a man in Jerusalem called Simeon, who was righteous and devout. He was waiting for the consolation of Israel, and the Holy Spirit was upon him. It had been revealed to him by the Holy Spirit that he would not die before he had seen the Lord's Christ. Moved by the Spirit, he went into the temple courts. When the parents brought in the child Jesus to do for him what the custom of the law required, Simeon took him in his arms and praised God, saying: "Sovereign Lord, as you have promised, you now dismiss your servant in peace. For my eyes have seen your salvation, which you have prepared in the sight of all people, a light for revelation to the Gentiles and for glory to your people Israel. "And why should it be you", he is questioned, "who is to wait for the Saviour?" Simeon replies, "As you well know, a man can travel far nowdays, even as far as to the heathens in Rome. But I have come to myself, to my own heart: Deep within it is inhabited by despair, the weariness of life, sins, the fear of failing, jealousy, an inferiority complex, pride, a yearning for attention and much more. Suddenly I realised that I need a saviour, a redeemer. And all our old scriptures speak of he, who is to come. Even Eve believed she had found the redeemer as she named her first born son "won". Yet it was this son who became the murderer of his brother. As he died Jacob called aloud, "Lord, I await your salvation!" And what about the prophets? Did they not continually see the arrival of the Messiah? Do you not know the scriptures? "Oh, well," they answered, "that may be as it is. Our ancestors dreamt up some things, but who can say that what they dreamt of will come true? And can it be true that you will see the saviour?" Simeon replied, "You can see it is like this: Through the scriptures we learn that the saviour will come. And through the Holy Spirit we learn, I learn, that he will come to me. Behold the lamb of God, who will carry away the sins of the world. And the Holy Spirit says, Behold the lamb of God, who will carry away your sins. The angel says to the shepherds, ...a saviour has been born to you. From the Holy Spirit I learn, ...a saviour has been born to me. That is how I know that I will see the saviour." The question Simeon pondered over is not very popular today. And yet this text can be frightening. For it could mean that we will die before we have seen Christ our Lord and saviour. That would be terrible. To die without having known the one who could save us from the anger of God, sin, debt and eternal damnation. "Man is destined to die once, and after that to face judgement." And all that without a saviour! without a redeemer! without the forgiving of our sins! Without the hope of life eternal! Blessed is he who can speak as Simeon does: ...now dismiss your servant in peace. For my eyes have seen your salvation! Rembrandts last painting which remained not quite fully finished. 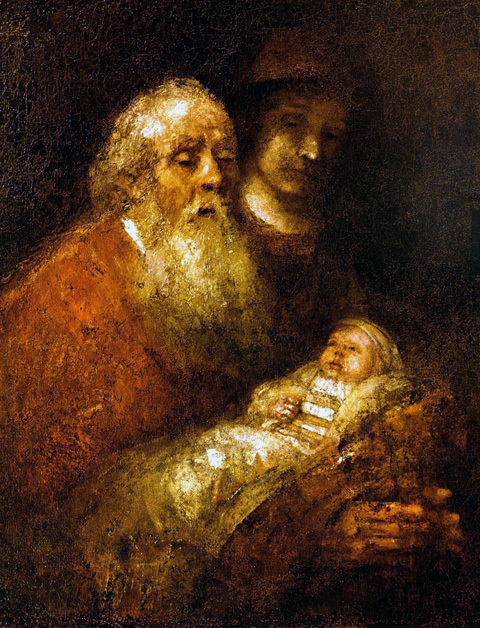 However because of this, Rembrandt gives us the impression that at the end of his very active life he too could join Simeon in saying, "now dismiss your servant in peace as you promised. For my eyes have seen your salvation!"